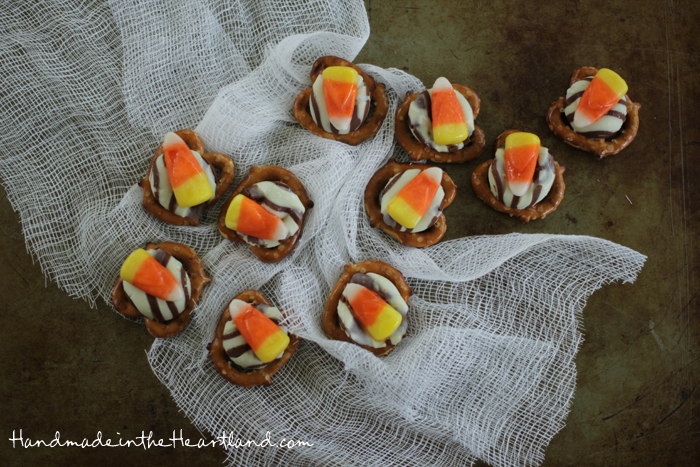 Candy Corn Pretzel Bites. These little snacks are so cute, the perfect little Halloween treat to serve up to friends and family or just to have around the house during the holiday season. 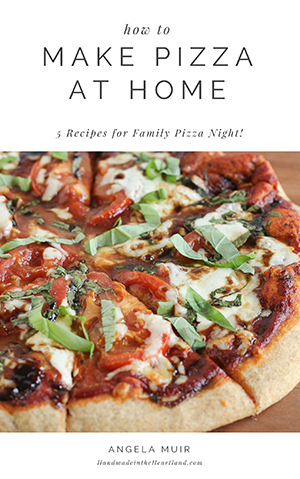 They are so quick and easy to make! I’m really ready for cooler weather, I don’t know about you but it’s been hotter than heck in KC and I’m currently in Nashville and it’s the same here. I keep seeing all these fabulous fall treats everywhere and i’m just not feeling the fall spirit yet, i totally blame the weather! Regardless of how i feel i decided to post one of the fall treats that my mom makes, we adapted them from a christmas treat we make to work for Halloween. So here are our candy corn pretzel bites, a super easy, perfect little treat to pop in your kids’ lunches, snack on at a party or take to work. These candy corn bites are so easy, festive and delicious snacks for the Halloween season! I love to have these candy corn bites out at parties for snacking! When I make these I always use my Silpat- read all about why I love my Silpats HERE. 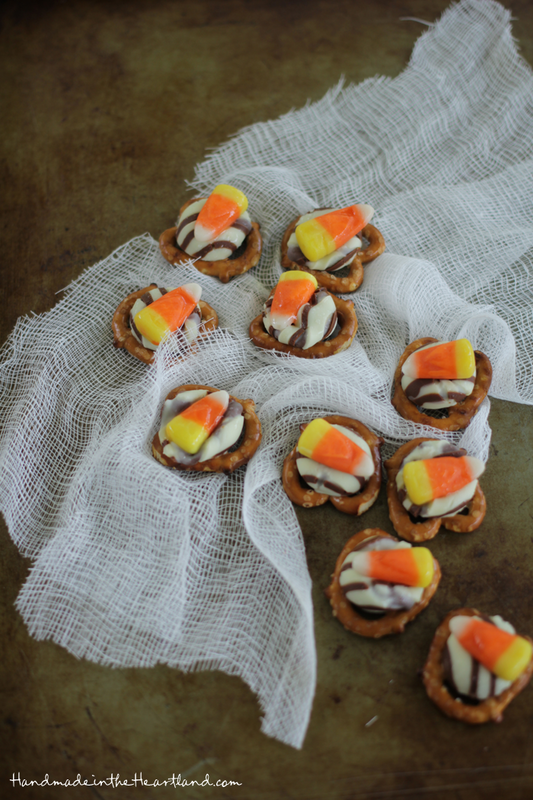 These Candy Corn Pretzel Bites are the perfect snack for a Halloween party! Place your pretzels on a Silpat & perforated baking sheet or cookie sheet with an unwrapped hug on each pretzel. Pop them in a oven at 175 degrees for a few minutes, 3-5. Take them out and push the candy corn down on the hug, it should be melty and easily press down. Let cool and enjoy!